This research study involved the usage of extensive secondary sources including directories; databases of articles; journals on airborne laser scanning, company newsletters; and information portals such as Hoover’s, Bloomberg, and Factiva to identify and collect information useful for this extensive, technical, market oriented, and commercial study of the market. Primary sources are several industry experts from core and related industries, OEMs, vendors, suppliers, technology developers, alliances, and organizations. These sources are related to all the segments of the value-chain of this industry. The airborne laser scanning ecosystem comprises OEMs such as Saab (Sweden), Teledyne Technologies (US), Leica Geosystems (Switzerland), and FLIR Systems (US), among others. 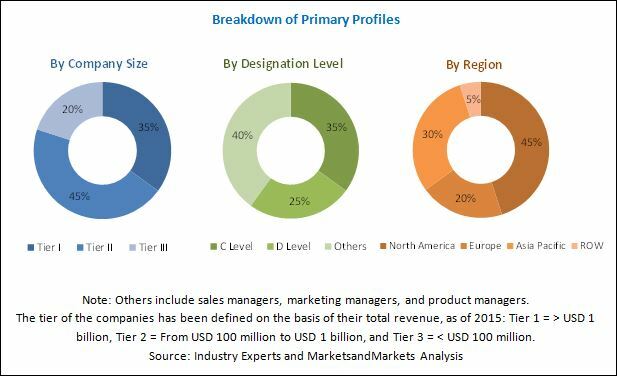 The global airborne LiDAR market is projected to grow at a CAGR of 17.32% from 2017 to 2022, to reach a market size of USD 2,533.7 million by 2022 from an estimated USD 1,140.1 million in 2017. This growth is attributed to the increasing use of unmanned aerial vehicles in various applications and increasing adoption of LiDAR in engineering and construction applications. The report segments the airborne laser scanning market on the basis of solutions into system component and industry services. The system component segment covers hardware such as lasers, scanners, interface devices, among others, and software, while the industry services segment includes services provided for end-user industries such as defense & aerospace, transportation & logistics, and oil & gas, among others. The market is also segmented on the basis of type and platform. The type segment covers topographic LiDAR and bathymetric LiDAR while the platform segment covers fixed-wing aircraft, rotary wing aircraft, and UAVs. Among service end users, the transportation & logistics segment is expected to be the fastest-growing segment. Highway and railway authorities use aerial mapping services provided by different service providers in the airborne laser scanning market. The increase in transportation and logistics activities is fueling the growth of the airborne LiDAR service end users market. Fixed wing aircraft is the largest segment of the airborne laser scanning market, by platform. It mainly covers fixed wing general aviation aircraft. In the general aviation industry, a large number of light aircraft are designed and built by amateur hobbyists and enthusiasts. The ones manufactured by OEMs are mostly used commercially to survey, photograph, film, and for freight transport, passengers, and sightseeing, as well as personal use. Significant growth in general aviation worldwide and increasing preference for cost-effective air travel for surveys and recreational activities are the primary factors expected to support the growth of the light aircraft market during the forecast period. In this report, the airborne laser scanning market has been analyzed with respect to regions, namely, North America, Europe, Asia Pacific, and Rest of the World. 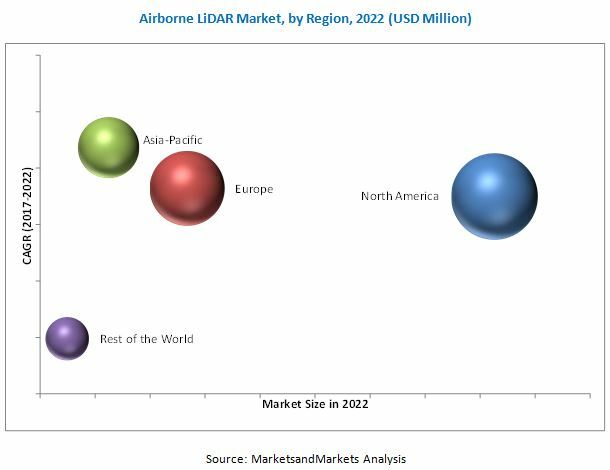 North America is expected to dominate the global airborne LiDAR market during the forecast period, owing to the increasing use of LiDAR in surveying and mapping applications. Asia Pacific is estimated to be the fastest growing market for airborne LiDAR during 2017 to 2022. The growth of this market can be attributed to the increase in surveying and mapping operations due to the rising infrastructural development, increased focus on agricultural management, and rise in mining activities in the region. China, India, and Japan are the key airborne LiDAR markets in this region. China is the largest airborne LiDAR market in Asia Pacific, due to the rise in surveying and mapping activities in the country. In India, the commercial and government sectors are procuring airborne LiDAR for mapping applications, which is fueling the demand for airborne LiDAR in the country. LiDAR is a modern and trusted technique employed globally to obtain fast and accurate terrain imagery and models. LiDAR models and imagery are used in a variety of applications across a wide range of industries, including, but not limited to, agriculture, forestry, mining, aerospace & defense, construction, and infrastructure development. Owing to modern technologies and global acceptance, a number of optical and electro-optical/infrared/equipment/services manufacturing companies include airborne laser scanning as a part of their product portfolios. The demand for terrain mapping and imagery across industries has also led to the mushrooming of the demand based LiDAR service industry. However, the lack of awareness among end users is restraining the market growth and technological constraints pose a challenge in the use of LiDAR. However, immense opportunities in GIS applications will positively impact the market growth. Leading players in the airborne laser scanning market include Saab (Sweden), Teledyne Technologies (US), Leica Geosystems (Switzerland), and FLIR Systems (US), among others. Contracts & agreements was the strategy most commonly adopted by the top players, constituting more than one third of the total developments from 2014 to 2017. It was followed by new product developments, expansions, and mergers & acquisitions.